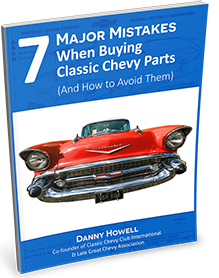 We want to hear from people who have learned lessons while restoring their Chevy. What nuggets of golden wisdom are you able to pass along to someone who is just getting started in restoring their Chevy? We plan on compiling this list into a free guide that we will distribute for people who need help restoring their car. A complete and comprehensive list of 1962 Chevrolet factory installed options and accessories for all Chevrolet models. A complete and comprehensive list of 1963 Chevrolet factory installed options and accessories for all Chevrolet models. Since its inception in 1911, the Chevrolet Motor Company has created reliable, stylish vehicles for the average American family. With a wide range of body styles and easy accessibility of parts, it is no wonder that classic Chevrolet vehicles inspire collectors and fan clubs with a passion for Chevys. Enthusiasts often become fascinated with the history of the classic Chevys that most appeal to them. This post explains their fascination and why you, too, should enjoy the classics.